Need a kitchen remodel? There are a lot of factors to consider when making your kitchen remodel functional. The kitchen layout design, the task lighting, flooring, stainless steel appliances, custom cabinets and countertops are all key features. Your kitchen is the heart of your home. It's where you and your family prepares and cooks the meals, it's also for entertaining guests and eating together. Your kitchen design must accommodate all of these things. 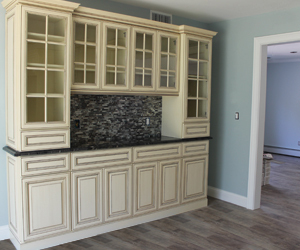 Wolf's Construction will give you the quality and functionality that you need to create your dream kitchen. We work with you to choose the best kitchen design options and materials with functionality in mind while staying with-in your kitchen remodel budget. All while increasing your homes resale value. Rest assured, we do all the work ourselves and never use subcontractors. Which shows in our finished custom kitchen renovations. 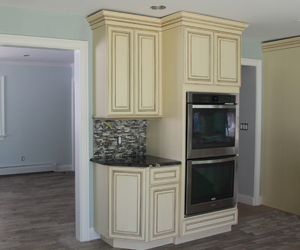 Call Wolf's Construction at 631-988-7661 to get your Free Kitchen Renovation or Kitchen Remodel Estimate. The homeowners existing kitchen along with the entire lower level had significant water damage from Super Storm Sandy. The kitchen was gutted, reconfigured, designed and built. Demolition, reconstruction and redesign had to be done to create a family friendly kitchen.